We are all invited to reflect on the fact that God Almighty has planted the seed of faith in Christ deep in the soil of both Palestinian (and Arab) and Israeli societies. Does this have significance for the vocation of Christ’s disciples who, though separated by walls of enmity because of the ongoing conflict, are united by their faith in Christ? The words of the Apostle take on new meaning in our context, “For (Christ) is our peace; in his flesh he has made both groups into one and has broken down the dividing wall, that is, the hostility between us. He has abolished the law with its commandments and ordinances, that he might create in himself one new humanity in place of the two, thus making peace, and might reconcile both groups to God in one body through the cross, thus putting to death that hostility through it” (Ephesians 2:14-16). Brought together, despite the walls of enmity, because “He is our peace,” Hebrew speaking and Arabic speaking disciples of Christ are called to show that justice, peace and equality are possible in our land. Our lives of faith must reveal the alternatives to war and violence, contempt and discrimination, engaging the other as brother and sister. Disciples of Christ can constitute a bridge between the Palestinian (and Arab) and Israeli worlds. We cannot assent to injustice and must be sensitive to injustice wherever it is present, especially in our own society. As disciples of Christ, we must also preach pardon as we have an intimate personal experience of being pardoned although we are sinners. And to learn more about Hebrew-speaking Catholics, check out “Hebrew Spoken Here” from the Spring 2013 edition of ONE. A burned-out section of the Benedictine Church of the Multiplication at Tabgha, Israel, is seen after an arson fire in late June. The Assembly of the Catholic Ordinaries of the Holy Land filed an official complaint to Israeli police against the leader of a radical Israeli movement over his remarks supporting and encouraging the burning of churches. Sister Lilly Chirayath sits with some of the children at the “House of Hope” in New Delhi. Name: Sister Lilly Chirayath C.H.F. More than 25,000 families live in the slums of southwest New Delhi, where even menial work is hard to find. Many people turn to petty crime or worse. And for the homeless girls the sisters have taken in, the orphanage has been a place that has literally saved their lives. The Chaldean bishop of Aleppo, Antoine Audo — shown in this image from 2013 — says he believes ISIS militants are seeking to push Christians out of Syria. One year after ISIS extremists stormed the villages of the Nineveh Plain in the middle of the night, driving out more than 120,000 Christians, most of those who fled remain in their places of exile. Largely due to the heroic efforts of the priests and religious sisters exiled with their community, however, panic and fear have been replaced by resilience and grace, said CNEWA’s president, Msgr. John E. Kozar. “The churches are working together, Chaldean and Syriac, Catholic and Orthodox, setting up educational and catechetical programs for children; health care facilities for expectant mothers, infants and toddlers, the handicapped and the elderly; counseling for all those struggling to cope; and temporary housing to replace the tents,” he added. “While much dignity has been restored — thanks largely to the work of the parish priests, religious sisters and parish volunteers, most of whom are displaced themselves — displaced Christians remain in limbo, and their long-term needs are great,” said Msgr. Kozar, who accompanied the Holy See’s Cardinal Leonardo Sandri on a pastoral visit to Iraqi Kurdistan in early May. During his many pastoral visits to displaced Christians in Iraqi Kurdistan, Lebanon and Jordan, CNEWA’s Msgr. Kozar said he is always struck by the indomitable spirit of the people he meets. “Again and again,” he said, “I have encountered resilience and hope. They want us to know one thing: They love the Holy Father. And they are grateful for his prayers. They want us to know they remain steadfast in their faith in Jesus. Securing bedding, clothing, hygienic supplies, food and water for Iraqi and Syrian Christian refugee families hosted by church communities in Jordan and Lebanon. Providing medical care for displaced families in Syria and refugees in Lebanon. Supporting educational programs for displaced Syrian and Iraqi children as well as assistance for refugees attending Catholic schools in Jordan. To learn how you can be a part of CNEWA’s work in the Middle East, visit this page. It was one year ago today that ISIS launched its greatest offensive through northern Iraq, displacing tens of thousands of Christians. 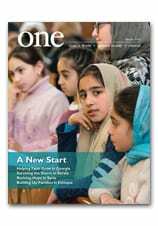 Don Duncan writes about that displacement and a recent visit to Erbil in the Summer 2015 edition of ONE. He offers some personal impressions below. On this, my second trip to Iraqi Kurdistan to cover the situation of displaced Christians there, I was struck by the dynamics of displacement and the ceaseless nature of human resilience. During my first trip, last September, the Christians who had fled the sudden onslaught of ISIS through their villages and territory just weeks prior were all heaving in a sort of mass trauma. The harsh reality of homelessness and displacement was beginning to settle in in painful waves. All this was happening as people found themselves and their families sleeping in churchyards without shelter, and later in basements of unfinished buildings, separated only by sheets of tarpaulin. Disease was rife. Anguish was rife. Panic was rife. The usual pillars of society — church, school, hospital and childcare — had all vanished and providers of care such as nuns, priests, teachers, and medics were all scrambling to simply stanch the crisis enough so as to find more sustainable solutions for the overwrought population. What I have found on my return this second time to Erbil is a soul-warming display of resilience. All the sites of hellish living conditions I saw in September lie empty. Most families are now either housed in rented houses or in emergency housing trailers, much like the ones used by FEMA in New Orleans after Hurricane Katrina struck. While living conditions are less than ideal, the edge of panic and woe seems to have lifted somewhat. The population, less in shock than before, is able to go about making their lives better. Nowhere is this clearer than in the infrastructure of care that has developed around the population over the past year. Whereas a very basic level of emergency healthcare had been established by September last, in the form of three CNEWA-donated pre-fab cabins, huge gaps lay in provision of basic services for a population badly in need. Now, in big measure because of the Dominican Sisters of Saint Catherine of Siena, the complex of schooling, healthcare, childcare and orphanage infrastructure that existed around these Christians at home, prior to their expulsion by ISIS, his being progressively restored. Temporary schools and clinics have been built and set running. An orphanage and kindergartens have been established. The community is beginning to display some of the daily rhythms of normality again: kids going off to school, mom cleaning the house or preparing dinner for when they come home. These are the vital signs of survival, it seemed to me, of a community in peril. A community that is able to rebuild itself from the ashes is, in essence, a community that will endure and persist and this fact has brought a strong sense of hope to the displaced Christians that was simply not present last September, when so many of the people I interviewed saw the events unfurling as the last chapters in the story of Christians in Iraq. I should stress that while the situation has improved and that this improvement is strength-giving, the overall situation is still far from ideal. The male population is still chronically under-employed, domestic tensions continue to flare in households, living conditions are still cramped and diseases are still rampant. While a vital measure of dignity has been restored, the displaced Christians are still in chronic need of yet more dignity in their living situations. Now, it seems, the displaced Christians are getting hope and strength from the specter of the resurrection of the infrastructure of community. Many are emboldened to carry on, to move on if they have to. Or, they hope, to move back to their own towns one day and start the reconstruction of their lost homes and communities there. A year into this crisis, the need remains great. To support those struggling to rebuild their lives in Iraq, visit our giving page. And please remember to keep these people in your prayers. Almost half of the earth’s 6.8 billion people associate Jerusalem with the Divine. Christians identify Jerusalem with Jesus, revere it as the place of his passion, death and resurrection, and celebrate it as the birthplace of the church. From the beginning, Christians have called Jerusalem the “Holy City,” a title that reveals the spiritual and political paradoxes plaguing it. Revered as a shining city on the hill, Jerusalem has come to represent conflict as it lies at the heart of the dispute between Israelis and Palestinians. The city’s chief church, the Orthodox Patriarchal Church of Jerusalem, has not remained above the fray. For centuries, this smallest of the ancient patriarchal churches of the East has weathered instability. Today, it includes fewer than 130,000 people — Arabs primarily — scattered throughout the Holy City, Israel, Palestine, Jordan and the Arabian Peninsula. According to ancient accounts, the apostle James “the Just” guided the church of Jerusalem after Pentecost, and was stoned to death about eight years before the Roman destruction of the Temple in the year 70. After his death, 15 bishops “of the circumcision” guided the mother church until the Romans nearly annihilated the Jews and leveled what remained of Jerusalem in the year 135. The mother church carried on, keeping alive the deeds and words of Jesus and, in 451, the fathers of the Council of Chalcedon recognized Jerusalem as a patriarchate, according its bishop a special status after Rome, Constantinople, Alexandria and Antioch. The Liturgy of St. James, which developed during this period, is considered the oldest complete form of the Eucharist to have survived and is used on feast days by the churches of the Byzantine and Syriac traditions. Pilgrims from throughout Christendom flocked to the shrines of the Holy Land even after the Muslim Arabs occupied Jerusalem in 637. The patriarch surrendered it to Omar, the successor of Muhammad, provided he left its churches untouched and allowed its Christians of all rites to worship unhindered. The caliph agreed and received the keys to the city. Though more than 13 centuries old, the Covenant of Omar remains an important legal document, outlining the rights of Christians in a Muslim state. Centuries later, responding to calls for help from the Byzantine emperor, Crusaders from the West seized Jerusalem, returning Christian sovereignty to the city. But the Crusaders installed a Latin patriarch and displaced the incumbent Byzantine patriarch, a Greek, whose line descended from the apostolic period. Relations deteriorated further when the Latin patriarch forbade the celebration of Eastern Christian liturgies in the Holy Sepulchre. These actions further widened the rift between the “Orthodox” East and the “Catholic” West even after the Crusaders kingdom collapsed and the city reverted to Islamic control. In 1852, the Ottoman Turkish sultan issued an order delineating the rights of the churches in the Holy Sepulchre and other holy places. He confirmed Greek Orthodox control, but granted concessions to the Armenians and the Franciscans. Scrupulous adherence to this “Status Quo” continues, but this fidelity has paralyzed dialogue and hampered restoration efforts. The Arab-Israeli conflict has eroded the Christian community, especially the dominant Orthodox Patriarchal Church of Jerusalem. Christians once led civic, cultural and intellectual life. Today, their influence is limited, even in the centers of Bethlehem, Jerusalem and Ramallah. In 1948, about 20 percent of the people in what is today Israel and Palestine was Christian, mostly Orthodox. Today, fewer than 2 percent remain. And whereas the patriarchal church of Jerusalem once commanded the allegiance of most Christians in the Holy Land, today only about half remain in the Orthodox Church. The revival of the Orthodox churches in Romania and Russia has bolstered the patriarchate of Jerusalem and heightened its profile, but its ultimate fate depends on a just political resolution between Israelis and Palestinians. Click here to read the complete profile.